Some of you may be on the mailing list of the Main Ingredient newsletter from John and Lynne Ford’s gourmet-goodies-one-stop-shop in Sea Point. I loved hearing about their kitten Hamish the Greedy Guts Gourmet, who had allegedly “sampled (and, mostly, enjoyed) mange tout, wasabi, sushi ginger, broccoli, pork crackling, Laksa coconut soup, a corner of the Cape Times, smoked salmon trimmings, roast potato and some tomato”. They reported that he wasn’t - yet - keen on wasabi. Recently pet-sitting two Terriers (one tall, one short) and a somewhat grumpy cat, I was delighted to make the acquaintance of the neighbour’s puppies. A Weimaraner called Chilli, and my favourite – a Beagle called Ramsay! I never asked what inspired the latter puppy’s name, but its owner lived in London so I’m assuming that a certain foul-mouthed Michelin-starred chef had something to do with it. Our impromptu pet-sitting braai recipe for peppered fillet has been dedicated to the ever-expectant appetite of Ramsay the Beagle. 1.Rub the fillet with olive oil on all sides. Sprinkle with crushed peppercorns and salt. Using toothpicks, fasten rosemary sprigs into any folds, securing them in place with toothpicks. 2.Cook the fillet on a braai grid over hot coals (wood and charcoal mixed) for 20 minutes. Cover with foil in a warm place off direct heat while the meat rests. Serve slices of rare meat. 1.Hydrate the dried mushrooms in a cup of boiling water. Strain and reserve the water. 2.In a saucepan, melt the butter and sauté the sliced fresh mushrooms for about 10 minutes. Add the drained mushrooms and strained water. Cook at high heat to reduce the liquid. Add a splash of wine while doing so. 3.Add the cream and keep reducing the liquid while stirring. The sauce should thicken slightly after about five minutes. 4.Serve warm with the peppered fillet. 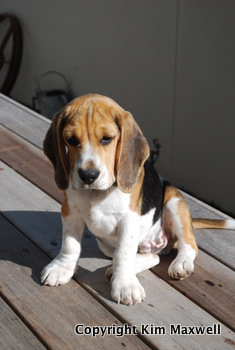 That is the cutest beagle puppy I have ever seen - apart from mine of course!! Loved your story, but would recommend not feeding any of your food to a beagle. They are crafty little dogs that will do anything for food. We have had our beagles steal strawberry tartlets - which took my mom hours to make and the beagle 5 minutes to devour - roast chicken off the dining room table, biltong - they broke the kitchen cupboard to get to - and numerous other foodstuffs. When we were young my mom was forever having to apologise to our friends mums and replacing school bags and lunchboxes that our beagles had destroyed. 'The dog ate my homework' was often a common excuse in our house!!! Why do French restaurants in Cape Town not serve Zucchini Chips.. So simple, so good and perfect as a starter.. Big pitty. If anyone knows if there is a restaurant in Cape Town that serves them - pls post. Craig, not sure I've had zucchini chips specifically but had a vague recollection of something similarly yummy at a CT Italian venue with a solid reputation. See the Magica Roma entry under my 'Do me a flavour' category on www.flavourcape.co.za for the full review. A regular diner tips us off about a non-menu item: sautéed calamari tentacles and tubes, grilled wafers of courgette, butternut and red pepper, dotted with creamy chilli sauce (R39.50). Top choice.